There are butterflies floating in the oceans all around the world. Usually only about a centimeter long, these beautiful, tiny creatures are actually snails that live their whole lives as plankton in the currents near the ocean’s surface. 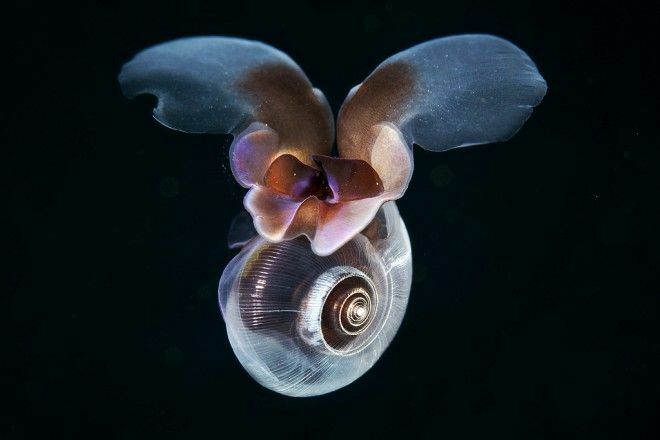 Sea Butterflies (Suborder: Thecosomata) are members of the group Pteropoda, which means flying foot. They have this name because of their muscular foot (in other snails used to slide along the ground) that extends into wide, thin “wings” that spread out to either side and are used to swim. This is an incredibly diverse and beautiful group of organisms that includes some of the most abundant species in the world, and almost no one has even heard of them! Sea Butterflies have some really cool behaviors! For one, they migrate up and down in the water column each day. 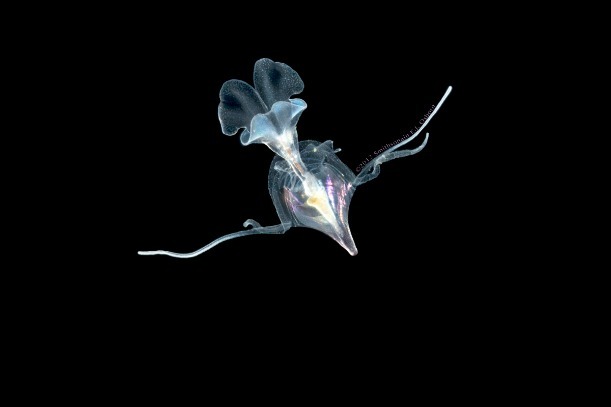 As the sun comes up most plankton species drop about 25 or 35 meters below the surface (and can go as low a 100 m or more), and the Sea Butterflies go right along with them. This is to avoid higher temperatures and higher risk of predation at the surface when it is daylight. At night, they come up to the surface to feed, another of their unique behaviors. These little snails secrete a net of mucus that is several times longer than their bodies. The let the net drift out away from them and catch plankton in the sticky mucus strands to feed on. Sea butterflies play an important role in the marine food chain. They are consumed by many species of fish, sea birds, baleen whales, and are the sole food source of another group of marine, planktonic mollusks, the Sea Angels. 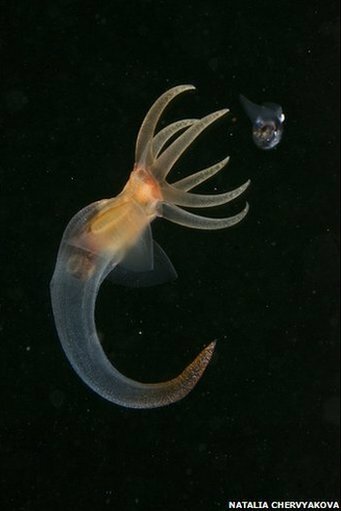 Sea Angels are tiny, planktonic sea slugs. Tiny, but still bigger than the Sea Butterflies that they hunt. To the left is a photo in which you can see a Sea Angel pursuing a Sea Butterfly. Sea Butterflies are now acting as a vital early warning system on climate change and the changing acidity of the world’s oceans. As CO2 levels in the atmosphere rise, the amount of dissolved CO2 in ocean water also rises, which makes the water more acidic. 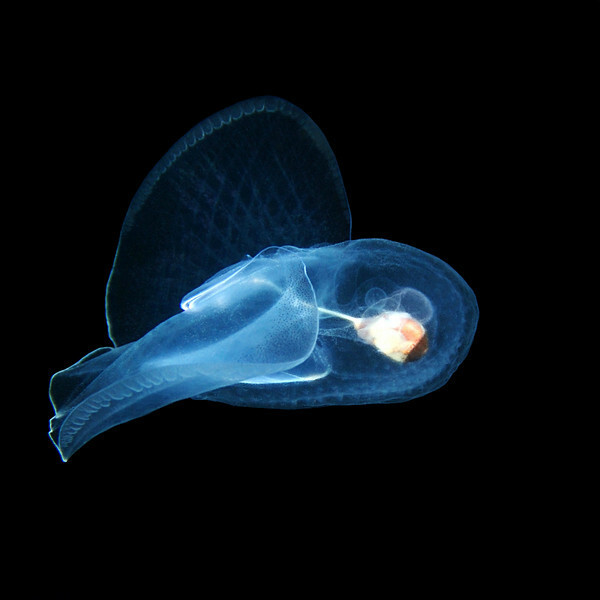 When the calcium-based shell of a Sea Butterfly is exposed to acid it starts to dissolve. Researchers are already finding Sea Butterflies with weakened shells in many oceans around the globe. The image to the right is an example of what this difference actually looks like. The healthy individual on the left has a smooth, clear, and unmarked shell. However, the Sea Butterfly on the right is not so lucky. See all those small white lines on the shell of this Sea Butterfly? Those lines are where the shell is dissolving away. These creatures are so small and sensitive to changes in their environment, that they have been referred to the ocean’s “canary-in-the-coal-mine” in terms of warning us about the effects of climate change. Effects that will only get more pronounced as CO2 levels continue to increase in the atmosphere and ocean.